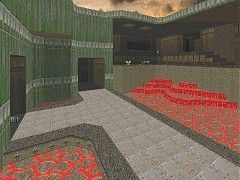 Remake of Quake map DM4 for Doom2 DM. 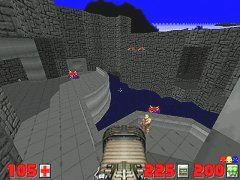 My first Doom2 map and I wanted to do something very vertical, and I had already done a DM4 remake once so this seemed like a nice first challenge. Removing all the rooms above rooms from the original was rather easy, mostly done by moving stuff apart. Most complex was the GL area which I solved by making it one level (already on the original you can go in all directions by jumping to the ledge on the side). I took great care that the original connectivity was preserved. 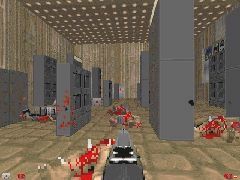 As to weapons, it is pretty close to the original but I had to swap some things around to make it most fun in "old deathmatch" mode: I originally had the LG replaced by a plasma gun but that would have made that area too campable so I moved it to the RL/HH area. Obviously a map like this will be most fun with the full mlook/jumping experience, but I made it just flat enough that it is playable without them.